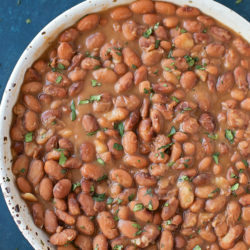 Fool-proof no soak Instant Pot pinto beans. They are tender and flavorful and best of all, effortless! The perfect side for a fiesta! 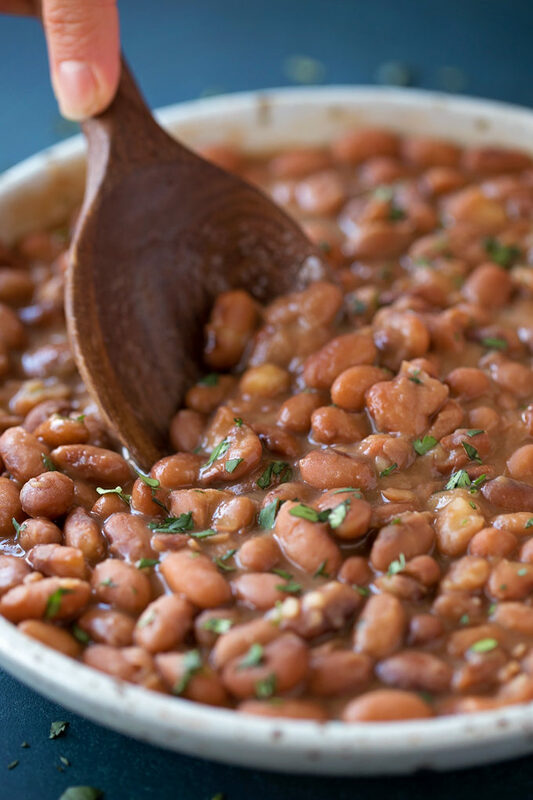 Who else has been intimidated by cooking dried beans? Maybe it’s the long soak or the fussy cooking process. Whatever it is, I NEVER seem to get them right when cooking them on the stovetop. Then I tried making them in the Instant Pot. Success! They were tender, flavorful and absolutely delicious. 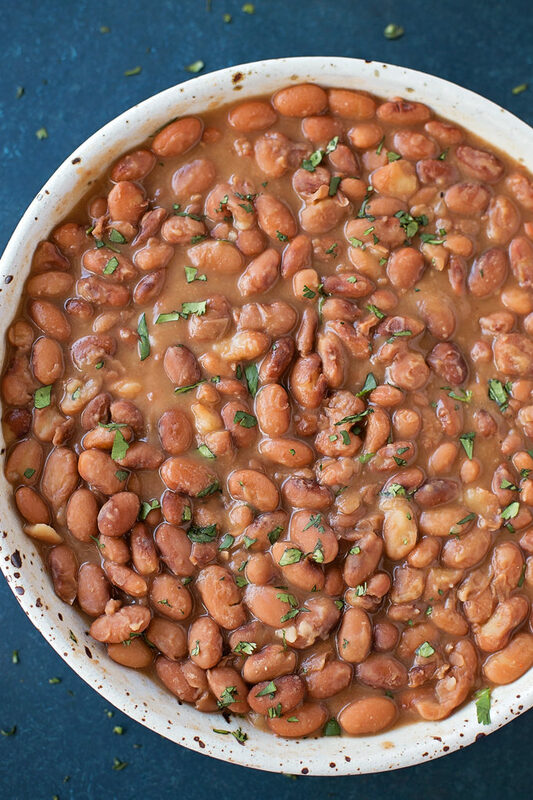 These no soak Instant Pot pinto beans are so versatile. 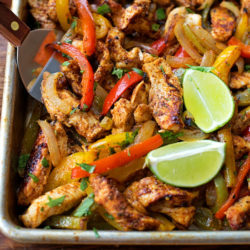 You can use them in a variety of Mexican dishes or on the side. They last for up to a week in the fridge which means you can repurpose them again & again if you don’t eat them all in one sitting. Everything is done in the Instant Pot with the exception of dicing the onion. Simply cook the bacon down a bit (it doesn’t need to be fully cooked) saute the onion and then add everything else in. Easy, right? P.S. Don’t skimp on the seasoning- it’s what makes these beans! Make sure you use fresh dried pinto beans. By that I mean don’t use beans that have been sitting in your pantry for more than 6 months. The longer beans sit, the longer they take to cook and the higher the chances are that they will be hard after the given pressure cook time. Once the beans are fully cooked, open the lid, remove the bacon and stir. Let the beans sit for 5 minutes to absorb some of the liquid. The longer the beans sit, the thicker the liquid will get, so don’t worry if it looks runny at first. Garnish with some cilantro and enjoy! Turn Instant Pot on SAUTE mode. Once hot, add the bacon and cook for 2 minutes, flip and continue cooking. Add the onion and stir, cooking for about 2 minutes. Pour in the broth and water. Add the garlic powder, salt, chili powder, cumin, coriander, paprika, black pepper, cayenne pepper, and pinto beans. Once cooked, allow for the pressure to release naturally, this usually takes about 15-20 minutes. Open the Instant Pot and remove the bacon and stir. Let rest for 5 minutes before serving. Garnish with cilantro if desired. Cooked beans will last for 1 week in the fridge. ** If using older beans, you may need to add up to 10 minutes additional time. Yay! I love to hear that. My dad is too and he loved this version! Made this, and loved it! Passed the hubby test too. He really liked the taste. Question, would this freeze okay? It’s just he and I; to avoid waste I like to freeze a portion when it’s feasible. Thanks! Hi Kim! I haven’t tried freezing these before, but I don’t see why no – they should freeze just like cooked canned beans. I add ground meat to the pot and serve with cornbread. I thicken them by mashing up some of the beans and stirring back into the mix. I own a FoodSaver and use it to seal them. They freeze perfectly. You could use ziplock bags and remove all of the air before freezing. Probably too late for this comment, but I freeze these beans all the time. I use a food saver and vacuum seal them. Works great. Might be a little more mushy when you defrost, but barely. I always make extra and keep some in the freezer! I freeze beans all the time & they keep wonderfully. I usually add water to them when reheating because the juice always seems thicker. I made these last week and you’ve ruined me. I can’t ever eat canned beans again! They were delicious! I have a question though. If I did soak them the night before could I use the sane recipe and just cook them for a shorter amount of time? Would I have to use less water if they are already soaked? I can’t say for sure but even the overnight soak usually only shortens the cooking time by <5 minutes overall. That being, in my opinion, it's never worth the effort of presoaking. As for the other component of your question, I think all the Instant Pot recipes I've encountered for dehydrated beans have all had essentially the same recommended amount of water for both pre-soaked and beans that have not been soaked, overnight or quick. Could I use beef broth instead of chicken broth? I made these a couple weeks ago exactly by the recipe and they were amazing. By far the best I’ve ever eaten. 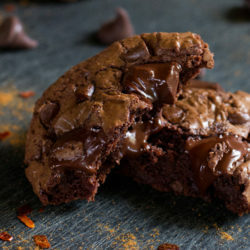 If you haven’t made these yet do it now you’re missing out! I know I’m a little late replying lol but the beef broth worked just as well as the chicken. It was amazing! Followed the directions, used organic pinto beans, cooked 47mins, they weren’t done Done!! Put them on again for 30 minutes More, Hope they get done!! Yes, older ones will take much longer! Up to 15 minutes!! What setting do you put the pressure valve on, sealed or open? The pressure valve should always be in the sealed position right after closing the lid. Does that make sense? 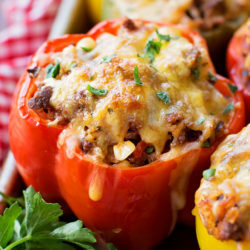 MMM, these are so flavorful and healthy. Thanks for the recipe! Have you ever tried this with a ham hock?? 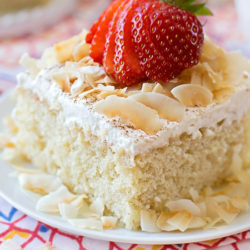 Making these tonight and I have one in the freezer! Also, wondering if 2 pounds of beans would make the instant pot too full? You bet I have. So delicious!! You know, I think you’d be fine doubling it. Please come back and let me know how it worked for you! I double beans in my Power Quick pot all the time. I made 2# and it turned out great! This recipe is fantastic! 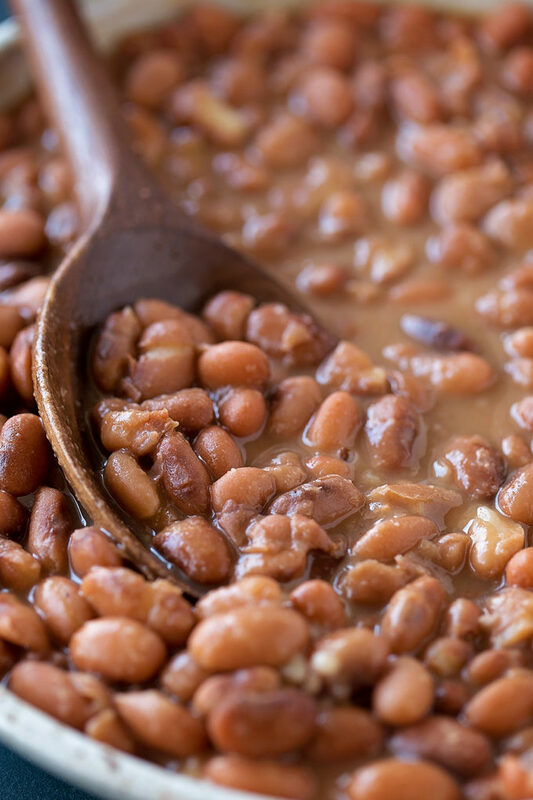 Best pinto bean recipe I have found. Husband and kids thought it was great, too! I’ve cooked soaked pintos in my instant pot many times, but today I didn’t plan ahead. Looking for a recipe to give me timing and quantity of liquid for cooking dried beans and found this. Great recipe. I didn’t have any bacon on hand, so I used the trick that gives dishes a smoky flavor when I cook for vegetarian friends. In place of the bacon and cayenne, I added a heaping teaspoon of ground dried chipotle pepper. and I subbed smoked sweet paprika for the regular paprika. Oh, and since I didn’t have the rendered bacon fat, I used a couple Tbs butter to saute the onions. Ok, I’m one of those annoying people who praises a recipe but I didn’t actually follow it! Really, I would have if I’d had the bacon, what can I say?! This recipe was great inspiration for my interpretation. The beans ended up with both heat and smoky flavor. Thanks! My Spouse is also a vegetarian so we always add a couple dashes or to taste of Liquid Smoke (Hickory). It gives a great smokey flavor. These beans were amazing! Thank you so much!! I made this with cornbread on a cold rainy day. Hubby ate 3 bowls full! Now I’m searching on here to see if you have anything with Northern Beans. We love those too, but I usually just get the cans. What Instant Pot do you have? Hi, I usually make my beans on the stove, but since I just got my Instapot, I’m super hyped to use it for everything. I normally use salted pork slab and Rotel, do you think cook times will be the same if I use these ingredients? I would think so! I don’t see why either of those ingredients would change the overall time. Please let me know how they turn out! Making this now with ham and chicken stock I had in the freezer. Can’t wait!! Sounds delicious! I hope you love them! I’m not able to set the manual settings for 50 minutes to cook pinto beans, once it gets to 4 minutes it goes back to 0:00 help!! Eek! I’ve never had that happen before! After hitting manual you should be able to use the + sign to add more time. What size instant pot? 6 or 8 quote? I own a 6 quart Instant Pot. This is the “standard” size. An 8 quart will work too. What is an Instant Pot!? 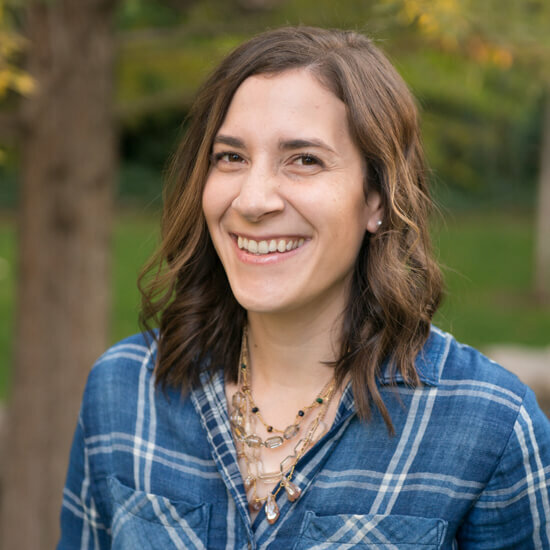 Brittany (9/1/2018) asked about soaking the beans before cooking them and I have the same question. I was taught to soak beans to reduce gas and have found that doing so also has the advantage of making them “creamy” and just down right delicious. Would I use less liquid and make an adjustment to the time? I also had this exact question! I went looking for an answer, and found one: Cook the soaked pinto beans for 1/2 the time (25 minutes). Add 3-31/2 cups water or broth for one pound of soaked pinto beans. Supposedly soaking them first aids in our body’s ability to digest beans. Do you also add water to the soaked beans? This recipe calls for broth and water. Thanks! I have always slowed cooked my pinto beans so tried your recipe with my recipe which I add a can of Rotel, and one light beer ( Tecate) for this batch, as part of the liquid. I used no water only chicken broth and beer for about 7 cups of liquid which is plenty to have a nice broth…. I also always dice my bacon and leave it in, do not remove….. only other thing, I deleted the cayenne pepper since I was using Rotel and added about 1/2 tsp of jalapeño salt… the beans were tender after 50 min.. I like mine quite a bit softer so switched to normal mode in the slow cook setting for another 2 hours since it’s Sunday and I am home also making chili and Mexican cornbread. So if I were to do it all under pressure not sure how much total time I would want to use to get the beans to the softer state we enjoy with our chili. And advice ? 50 min pressure and mine were soft but al dente. Hi Laura, I’d suggest letting them go for another 10 minutes. Did you do a natural or manual release? 1 and 1/2 cups water does not seem like enough to cook a pound of dry beans. ? I think she must have missed the “4 cups chicken broth,” for a total of 5 1/2 cups liquid! I finally found the perfect recipe for well seasoned pinto beans in the instant pot. Thank you! They were delicious!! The reason liquid in an instant pot doesn’t sound like enough (but it is) is because there is no steam escape. I learned this trying to make rice. My stove top recipe is 1 cup long grain rice to 2 cups water. The first time I made rice in the I P I did the same ratio and had a complete mess slurry if you will. When I found a recipe and followed it the ratio was 1:1 and it works beautifully. The stove top doesn’t have the sealed environment so half your water evaporates and you need more. Thanks for this recipe! This is by far my favorite dry beans recipe. 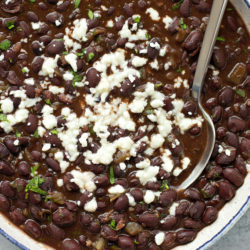 I plan to use the same recipe with black beans and will let you know how it goes! 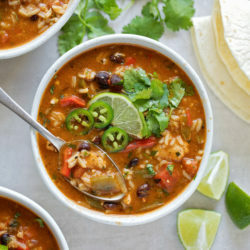 I like the save the cooking liquid to cook rice with, or if I’m making refried beans use it as the liquid to add back in the pan! 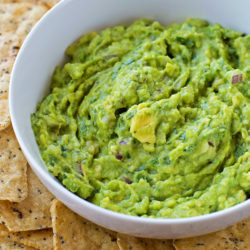 I recommend this recipe to everyone I know with an instant pot. 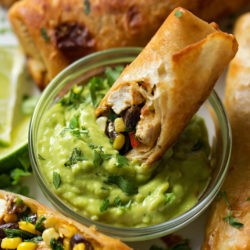 It’s perfect for making freezer bean, rice and cheese burritos. Easy substitutions for vegetarians are butter in lieu of bacon and veggie stock instead of chicken. If I want to cook 2 lbs of beans should I double the rest of the recipe? My family loved the recipe for your pinto beans. Thank you for posting it. I saw the beautiful pictures of your family and was reminded of the advice my Mom-in-law gave me when we had our first and only son. Put all the great things your children do and say in a journal because you will never remember all of them. Though you look like the kind of Mom who is probably already doing that! I tired this recipe but I sauteed a tbsp bacon flavored bits & onion together. I used 2 cups of water instead of the 1.5 cups and no coriander because I didn’t have any. The beans smelled so good & came out great. I will be making them again.